Firstly, it’s not to be confused with the Devonshire group of excellent hotels and pubs [think Devonshire Arms at Bolton Abbey – about which more later]. 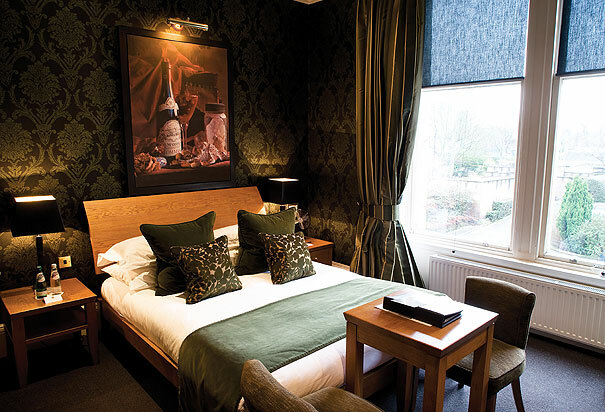 One Devonshire Gardens – what an address – is the flagship hotel of the Hotel du Vin group, who manage to open beautifully restful and, largely, good value hotels in all the cities you’d quite like to visit for the weekend. Glasgow, Cambridge, Newcastle, York, Bristol, Harrogate, Cheltenham, Henley-on-Thames – you get the picture. However, One Devonshire has a unique claim to fame. The hotel was opened in 1986 by Ken McCulloch and comprised numbers 1, 2 and 3. This stunning cul-de-sac terrace is at right angles to the Great Western Road [the A82] and the houses are ‘B’ listed. What that meant in practice was there was no ‘knocking through’ between the houses to create the hotel. You checked in at No 1, and then the porter popped out of the front door and down the road to, say, No 3. There was a connection ‘below stairs’ otherwise your scrambled eggs would have got quite chilly in the Glasgow climate as they promenaded down the street. They subsequently acquired No 5 and then, to fill in the gap, finally No 4, to complete the set [it’s a man thing, this collecting] and create the 49 bedrooms it has now. 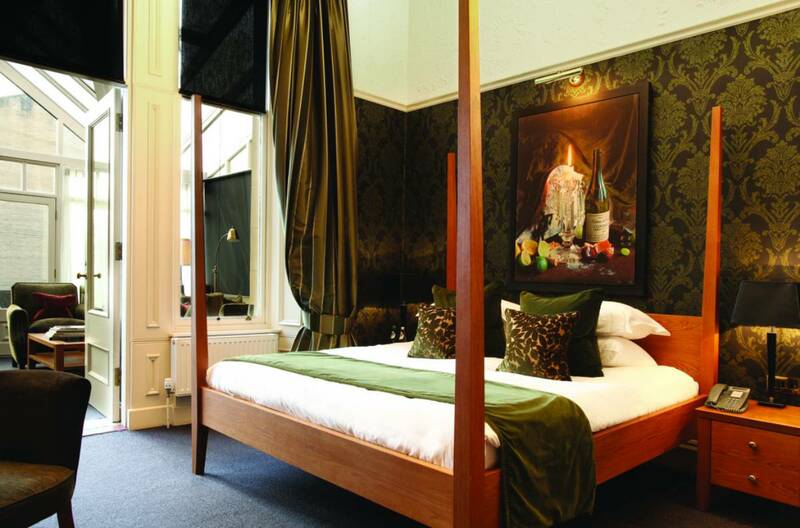 Glasgow’s first boutique hotel and a model for others around Scotland/The Uk/The World. Starting out as a trainee with British Transport Hotels, Ken McCulloch moved through wine bar development until he opened One Devonshire. 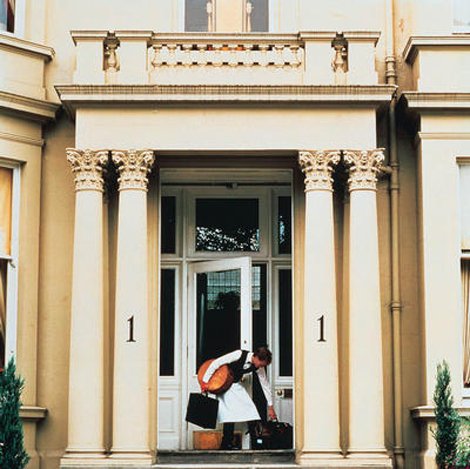 It soon became the haunt of celebrities – Bob Dylan, Madonna and Gordon Ramsay, who ran the hotel’s restaurant. Not content, Ken went on to found the Malmaison chain of hotels who in turn acquired Hotel de Vin. The first Dakota opened in Nottingham in 2004 on an industrial site in the middle of Sherwood Forest. The monolithic building, with its exposed brickwork and blue neon-lit bar, sets it apart from other hotels – not least because it looks more like the HQ of a Japanese technology firm than an inn. We first stayed at One Devonshire in 1992, a weekend away in a strange city. After that we were converted. Glasgow is magnificent, sylish, architectural-rich, faintly industrial still, like almost no other UK city, and vibrant. Music, art, and amazing food. It makes a sharp contrast with the restrained and polite Edinburgh, although that’s great in its own way. Glasgow is above all Scottish but has no need to flaunt the tartan, or the pipes. It’s a city where the people are proudly Scottish and fiercely independent. You can walk from One Devonshire either down the Great Western Road, lined with Glasgow’s rich collection of Victorian terraces [Alexander “Greek” Thomson‘s Great Western Terrace], or you can meander through the “West End”, that glorious collection of stone houses that have remained intact through all the changes that the 19th and 20th centuries threw at it. No other industrial city has managed this – Leeds, Manchester, Liverpool have all seen their similar areas lose their gentility and the population decant to more leafy suburbs. Not so Glasgow, the West End is the place to be. Great restaurants. 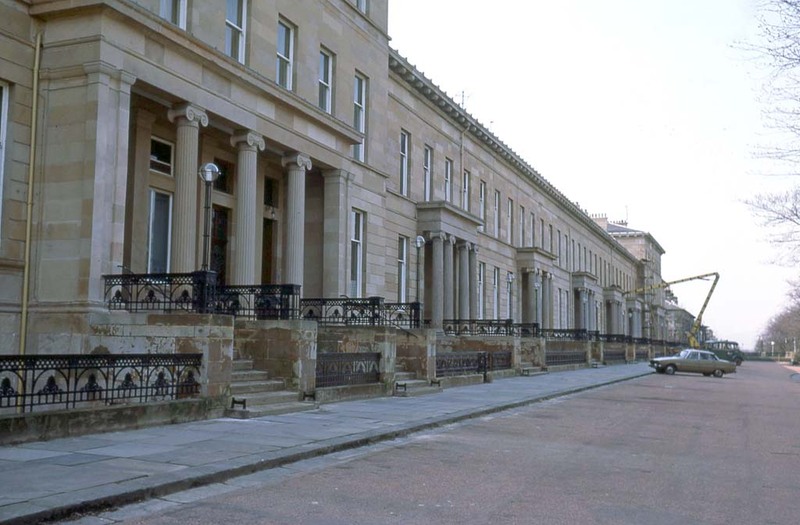 Fabulous terraces such as Park Circus near Kelvingrove Park [you’ll find 15 Glasgow there], or any of the terraces and circuses to the west of Byers Road. Elegant beyond belief. Sounds amazing. I really like the classic design of the room.